Business process flows Create business process flows for this entity. Notes Append notes to records for this entity. Notes include the ability to add attachments. Activities Associate activities to records for this entity. Connections Use the connections feature to show how records for this entity have connections to records of other entities that also have connections enabled. Sending e-mail (if an e-mail field does not exist, one will be created) Send emails using an email address stored in one of the fields for this entity. If a Single Line of Text field with format set to email doesn’t already exist for this entity, a new one will be created when you enable sending email. Queues Use the entity with queues. Queues improve routing and sharing of work by making records for this entity available in a central place that everyone can access. Enable or disable entity options: The following screenshot and table lists the entity options that you can enable or disable at any time. Primary Image System entities that support images will already have an Image field. You can choose whether to display data in this field as the image for the record by setting this field to [None] or Default Image. For custom entities you must first create an image field. Each entity can have only one image field. After you create one, you can change this setting to set the primary image. Mail Merge People can use this entity with mail merge. Document Management After other tasks have been performed to enable document management for your organization, enabling this feature allows for this entity to participate in integration with Microsoft SharePoint. Access Teams Create team templates for this entity. Duplicate Detection If duplicate detection is enabled for your organization, enabling this allows you to create duplicate detection rules for this entity. For information about enabling duplicate detection. Allow Quick Create After you have created and published a Quick Create Form for this entity, people will have the option to create a new record using the Create button in the navigation pane. 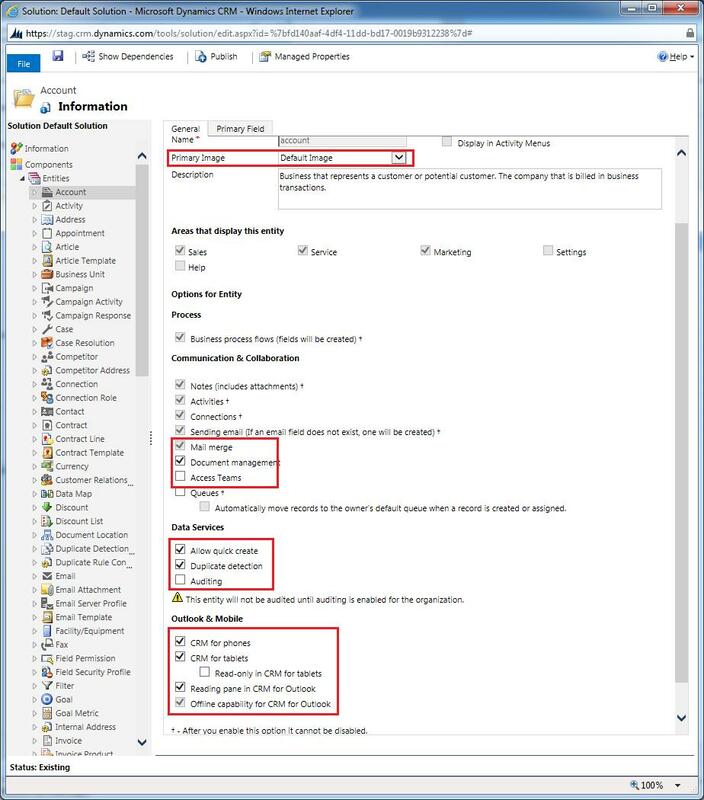 When this is enabled for a custom activity entity, the custom activity will be visible in the group of activity entities when people use the Create button in the navigation pane. However, because activities don’t support quick create forms, the main form will be used when the custom entity icon is clicked. Auditing When auditing is enabled for your organization, this allows for changes to entity records to be captured over time. When you enable auditing for an entity, auditing is also enabled on all its fields. You can select or clear fields that you want to enable auditing on. CRM for phones This entity will be available within the Microsoft Dynamics CRM for phones application. CRM for Tablets This entity will be available using Microsoft Dynamics CRM for tablets. You also have the option to make this entity Read-only in CRM for tablets. If the forms for an entity require an extension that isn’t supported by CRM for tablets, such as IFRAME or web resource controls, use this setting to ensure that the data for these entities is not editable by people using CRM for tablets. Reading pane in CRM for Outlook Records for this entity can display in a read-only view in CRM for Outlook. 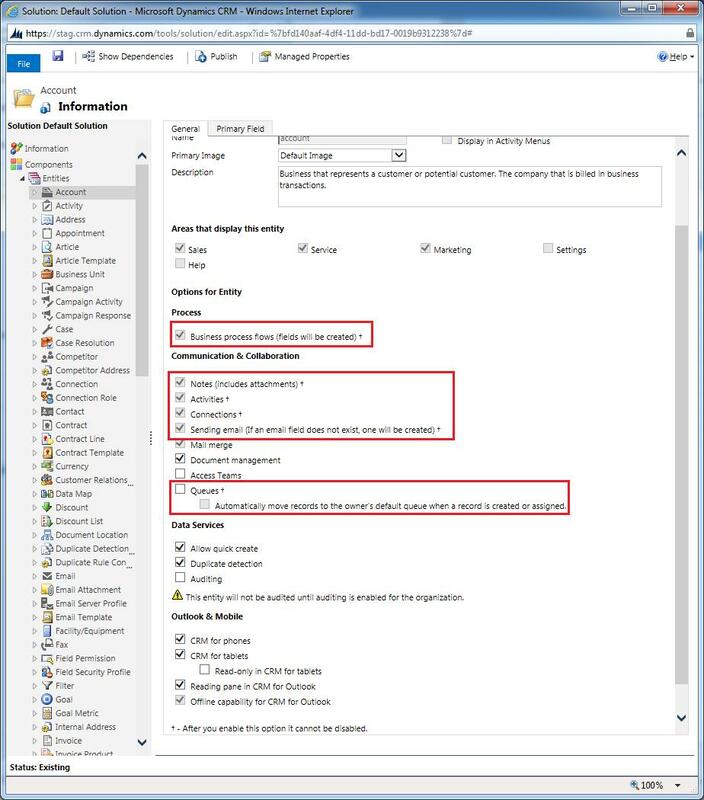 Offline capability for CRM for Outlook People using Microsoft Dynamics CRM for Outlook can choose to include data from this entity with the data they take offline. Warning: Each entity that you enable for offline capability directly affects the time required for people to synchronize data when they come back online. This is especially true for people with less powerful computers. Carefully consider if an entity must be available for people while working offline. This entry was posted in CRM 2013 and tagged CRM 2013, Dynamics CRM 2013, Entity options, Microsoft Dynamics CRM 2013, MS CRM 2013. Bookmark the permalink. Though mail merge is among the list of those communication and collaboration in entity creation that can be enabled and disabled but in practice it is not possible. If otherwise, explain the steps to disable Mail Merge.